Baron Tools 7/8 Electric Hydraulic Rebar Cutter. This rebar cutter will cut up to 7/8 #6 grade 60 rebar in less than 4 seconds. This is the second most powerful electric cutter we sell. Uses 110 Volts at 50/60 MHz. Comes with maintenance tools, hydraulic oil, manual and metal carrying case. Tool weight is 33 lbs. Color of cutter may vary. VIEW ALL THE REBAR CUTTERS I SELL. TAKE A LOOK AT OUR FEED BACK ON THE REBAR CUTTER. 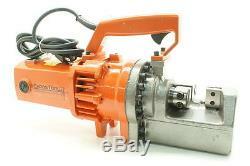 New 1 #8 ELECTRIC HYDRAULIC REBAR CUTTER (#390282347565). We also sell replacement parts for our rebar cutters. I M P O R T A N T! Upon receipt of the product or part(s) we will, free of cost to purchaser, repair or replace the faulty product or part. We shall NOT, under any circumstance, be responsible for any damage resulting from faulty installation or operation of the product and as such we recommend installation and assembly, where applicable, only by certified and qualified professionals. Unless otherwise clearly stated, this item is. All payments must be received within 7 calendar days of close of. Only applies to the 48 contiguous United States. (3) Item is used, or not in resalable condition. Items must be defective at the time of the first attempt to use. However, we must be contacted. About the situation beforehand in order to find the best possible solution. Within 14 days of having received the item. We must be contacted about your intent to return the item before you do so. By purchasing this item, the purchaser acknowledges that he/she has read and agrees with the policies, terms and conditions stated herein. The item "NEW 7/8 ELECTRIC HYDRAULIC REBAR CUTTER RC22 PORTABLE #6 REBAR TUBING PIPE" is in sale since Saturday, June 30, 2018. This item is in the category "Business & Industrial\Light Equipment & Tools\Hand Tools\Concrete Tools". The seller is "baron_tools" and is located in Brooksville, Florida. This item can be shipped to United States, Canada, United Kingdom, Denmark, Romania, Slovakia, Bulgaria, Czech republic, Finland, Hungary, Latvia, Lithuania, Malta, Estonia, Australia, Greece, Portugal, Cyprus, Slovenia, Japan, China, Sweden, South Korea, Indonesia, Taiwan, South africa, Thailand, Belgium, France, Hong Kong, Ireland, Netherlands, Poland, Spain, Italy, Germany, Austria, Israel, Mexico, New Zealand, Singapore, Switzerland, Norway, Saudi arabia, Ukraine, United arab emirates, Qatar, Kuwait, Bahrain, Croatia, Malaysia, Chile, Colombia, Costa rica, Panama, Trinidad and tobago, Guatemala, Honduras, Jamaica.